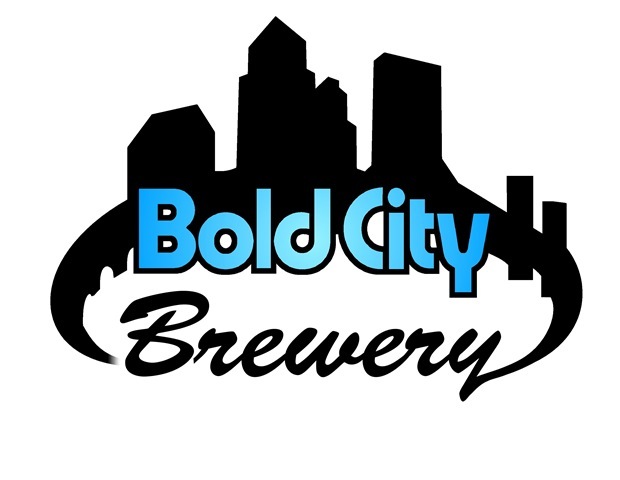 Bold City Brewery has been creating craft beer in Jacksonville for over six years. During that time they have said goodbye to several beers and added a few others. But, on February 8, the brewery will be welcoming back a popular brew that has been on hiatus for a while. Archie’s Rhino Rye Pale ale will be re-released at the Jacksonville Zoo and Gardens at a gala party for the benefit of rhinoceros conservation. Originally released in 2011, is a smooth and drinkable pale ale made with rye malt that can sharpen flavors and add complexity, crispness, and subtle spiciness as well as dry out a beer. At 6.5% ABV, the beer rides on the higher end of alcohol content for a pale ale. 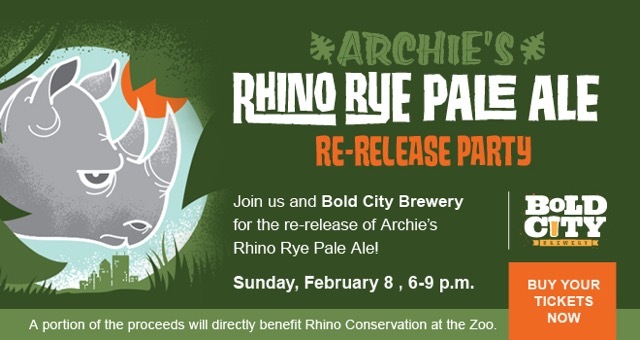 Since Archie’s Rye Pale Ale is named for the Jacksonville Zoo’s oldest male rhino, the re-release party will open with a ceremonial toast on the Rhino Overlook followed by a beer-themed dinner featuring bites prepared using Bold City Brewery beers. The evening will provide fun for all with rhino activities and live music on Shaba Terrace at the zoo. The event begins at 6:00 p.m. and continues until 9:00 p.m. Tickets are available through the Zoo on their website. It is sure to be a “Whale of a Summer” for Bold City Brewery lovers as they launch their summer tour and give away plenty of free pints, pint glasses, and T-shirts. In an article on the Amber Waves beer blog of the Florida Times-Union, Ed Stansel advises followers to keep an eye on Twitter for stops on the tour today through Thursday, June 7. The gang from Bold City will Tweet their location approximately 10 minutes prior to arrival on Twitter and will stay at each location for 45 minutes. Ten lucky customers at each location will receive Killer Whale pint glasses or T-shirts. In addition, the brewery crew will buy pints of Killer Whale for patrons at each stop. Killer Whale Cream Ale is one of the breweries most popular brews and has been a mainstay in their tap room nearly from its opening. Cream ales were originally brewed to compete with lagers in the Mid-Atlantic and Northeast portions of the United States. They are generally light in color, low in hop bitterness and maltiness; they are generally crisp and smooth on the palate. Killer Whale falls squarely into these characteristics and is a satisfying brew perfect for hot, humid Florida afternoons. 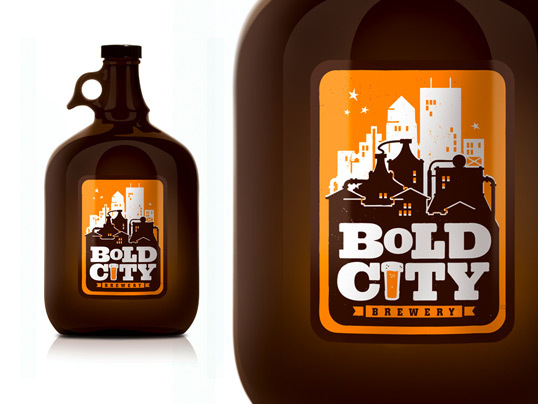 Follow Bold City Brewery on Twitter at: @boldcitybrewery. Bold City Brewery has set a number of firsts in Jacksonville; they were the first craft beer brewery, they opened the first tap room, they were the first to introduce the concept of the growler, they were the first to bottle their brews, and now, they will be the first to sell bottled six-packs of locally-brewed craft beers in the Jacksonville market. Sure, Bold City brews have been available in bottles at local grocers and liquor stores, but only in bombers and case packs. Now, if you want more than a single bomber and less than 12 bottles of beer from Bold City, you will have the option. “People have always asked me, when I’m out and about or here at the brewery, why don’t we do six packs.” said owner Brian Miller in his weekly newsletter to brewery fans today. The wait, and the questions, will be over next week when Miller expects bottles of Killer Whale Cream Ale to be available for thirsty beer-lovers at local outlets. It is always amazing the philanthropy that is so prevalent in the brewing community. But, all you have to do is take a look at the walls of the Tap Rooms of most local breweries and you will notice posters for many different causes. Some advertise a benefit for that St. John’s River, others are for disadvantaged children. Tonight, Bold City Brewing is holding a benefit for the Chron’s and Colitis Foundation of America. Because, one million, four hundred thousand Americans suffer from IBD, Bold City decided to do something to help. Tonight for every pint that you purchase, $1 will be donated to further research. 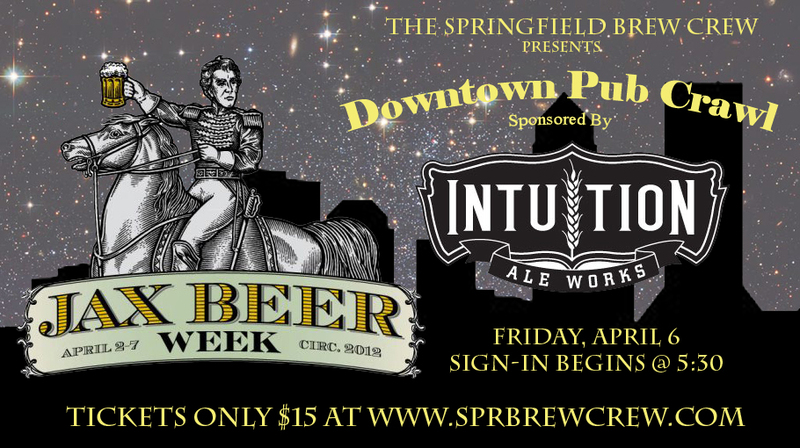 In addition to the per pint donation, a silent auction will be held from 7:00 to 9:00 pm. Again all proceeds will be donated to the Chron’s and Colitis Foundation of America. To top it off, live music will be provided by One Night Stand. If you would like to have a few beers, bid on the auction, and enjoy some music, stop by Bold City tonight at 2670-7 Rosselle Street. The folks at Bold City will be happy to have you and your purchases will help support a worthy cause. As I previously mentioned here, Bold City is planning a release brunch for their new “L” Coffee Stout, made with Bold Bean coffee. The brunch will take place tomorrow, Sunday April 15 at Moon River Pizza (www.moonriverpizza.net), 1176 Edgewood Ave S, # 2, from 11:00 until 2:00. Brian Miller, the brewer at Bold City says his new coffee creation has come out even better than expected, which is saying a lot considering the high quality of his other brews. In addition to the new stout, Dan of Moon River Pizza will by fashioning some awesome breakfast style pizzas to accompany the new brew. Expect to find a traditional breakfast pizza consisting of eggs meat and cheese, a veggie-style pie, and a dessert pizza created specifically for the new stout. While pizza may seem like an odd choice for a brunch, these pies sound out-of-this world good! Other Bold City brews will also be available for your drinking pleasure including Killer Whale Cream Ale and Fritz-mosas (mimosas made with Fritz heffewiezen). As if the new coffee stout and pizzas were not enough, the folks at Bold City and Moon River have also arranged for entertainment by slide guitar great John Emil. This accomplished artist has performed at major music festivals like the Telluride Blues and Brews Fest, the Lake Occonee Music Fest, the Florida and South Florida Folk Fests, and the Decatur Blues and Bluegrass Festival. Emil has supplied music for are “Dateline,” Anthony Bourdain’s “No Reservations,” CMT’s “Cribs,” and several international wildlife and nature documentaries. 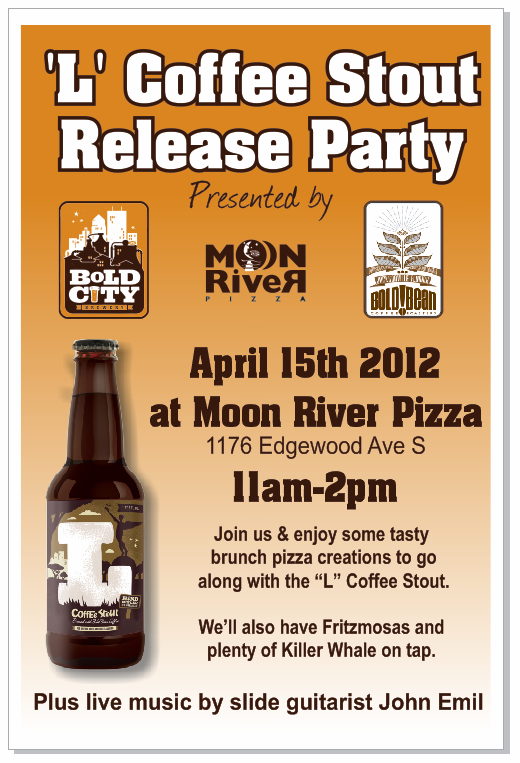 All of these ingredients combine to make what is sure to be a fun and exciting release brunch at Moon River Pizza.